While the multifidus is a relatively small muscle, it’s critical for spine stability and these effective multifidus exercises can prevent and rehabilitate low back pain. The multifidus is basically a bilateral series of muscles that are attached to the spine. Think of the vertebrae as the rungs and the multifidus as the rails on a ladder. Although it was once considered a relatively unimportant muscle because of its small size, researchers have since discovered that its unique design makes it one of the strongest and most important muscles in maintaining a healthy back. This muscle is composed of several fleshy and tendinous fasciculi (it means: a small bundle), which fills the grooves on each side of the spinous processes of each vertebra, and extends from the sacrum to the axis. One big myth is the role of the Transverse Abdominis in providing local segmental stability – it doesn’t, and is more a global stabilizer via the mechanism of intra-abdominal pressure. The Multifidus also has an unusually high number of muscle spindles. Muscle spindles are sensory receptors in your muscles that can detect changes in the length of a muscle and signal this information to your central nervous system. The central nervous system then uses this information to figure out the current position of the body. This is called proprioception: the ability of your body to sense where all of its parts are in space. Proprioception is how you can touch your fingers behind your back, and you can touch your nose when your eyes are closed. It used to be believed that the spine by itself was very stable and strong, but recent studies have shown that the spine, even though it’s very mobile, is also very fragile. In fact, it can only support about 20 pounds of weight before collapsing. Thus, muscular support is critically important for spine stability. This clearly shows how muscle weakness in general and specifically a weak or dysfunctional multifidus muscle can cause low back problems. Learning how to train the multifidus was a game-changer for my back. When I first started doing the Birddog, I was so shaky I felt like I was having a seizure, but I quickly improved with daily training. Then, when I started adding the more advanced exercises we’re about to go through, I noticed a significant jump in my power when throwing punches, taking shots in hockey and every other sport that requires swinging of a club, racket or bat. The reason why is because the transverse plane of motion is critical to power in most sports and is also the plane of motion least trained in the gym and the one that must be trained to effectively target the multifidus. So adding these exercises will not only help prevent and rehab low back pain, they’ll also improve your performance for any sport. Over-reliance on core stability exercises that only work in the sagittal plane of motion i.e. crunches and planks, do not effectively train the multifidus. The multifidus is activated most when stability in the transverse plane of motion is required. While this exercise has a funny name, and doesn’t look like it has anything to do with a dog; it’s a highly effective way to activate the multifidus and will encourage lumbar spine stability. There are a few variations, but we’re going to stick to the beginner’s version. First get on your hands and knees. Next, position your shoulders directly over your wrists while pointing your fingers forward and keep your hips over your knees. Then engage your abdominal muscles and lift your right leg straight to the rear while keeping your hips level. As soon as you feel stable, lift your left arm forward. Finally, stretch your body out. Make sure you keep your neck in line with your spine. Hold this position for a few seconds before returning to the starting position. 1-arm wall pushup: like the name says we’re going to use the wall as our working surface. Start by standing in front of a wall, next place one arm straight in front of you and firmly pressed against the wall and keep your free hand by your side. Now bend your elbow and drop your body toward the wall. Complete the movement by pushing back up. 1-arm table pushup: Same technique as when doing a wall pushup. Place one hand on a table keeping the elbow straight and keep the free arm by your side. Bend your elbow until your chest is close to the table edge and push back up. Place your legs farther back for greater resistance, closer for less. 1 arm pushup progression: the first progression starts from the standard pushup position, you’re going to slide one hand forward until your chest touches the ground. Finish the movement by sliding that hand back under your shoulder. This will increase the resistance on your working arm and teach you the necessary balance. For the next progression, you’ll need a ball. Start from the standard pushup position but place one hand on a soccer or basketball. The elevation and the instability of the ball will force you to adapt by relying much more on one side, developing the strength that will make a genuine 1 arm pushup possible. The last progression is hard so try to perform it when you’re fresh. Begin in a standard pushup with your arms straight, now drop until you’re half way to the ground – and hold it. Finally, slowly slide one hand to the side until your arm is straight and then slide it back for a sick level of isometric tension on your stationary side. The 1-arm row is a fantastic all around back exercise and is extremely useful for stimulating the multifidus. Here are three effective variations you can use. Find a weight bench and place a dumbbell on each side of it. Pick the dumbbell up from the floor with your left hand and hold the weight while maintaining a straight lower back. Pull the dumbbell straight up to the side of your chest while keeping your upper arm close to your side and the torso stationary. Start the standing one-arm cable row by attaching a single handle to a low pulley cable. Standing around 3 feet from the cable machine, grasp the handle with one hand, arm straight. Pull the handle toward you while keeping the knees slightly bent and your arm close to your side. You can put your free hand on your leg for stability. Last you can do the bent over 1-arm row: This is just a 1-arm dumbbell row without using a bench for support. It not only works the multifidus but also the whole core as you tense your waist to stabilize your upper body. This is a real core crusher; the T-lateral ball roll will attack almost every torso muscle in your body. Start by lying on your back on a balance ball so that your upper back is firmly on the ball. Raise your hips to form a straight line from your knees to your shoulders. Without letting your hips or arms sag, roll across the balance ball as far as you can, take small steps sideways with your feet, you should only be able to go a few inches before running the risk of falling off. Now reverse direction and roll as far as you can to the other side. This is exercise trains the multifidus and can also be used to get an incredible conditioning workout. Instead of going through it all here, check out another blog post I’ve written where I break down 7 different bear crawl variations here. Your spine needs the support of all its surrounding muscles, but the multifidus are critical to prevent it from collapsing under the weight it supports. 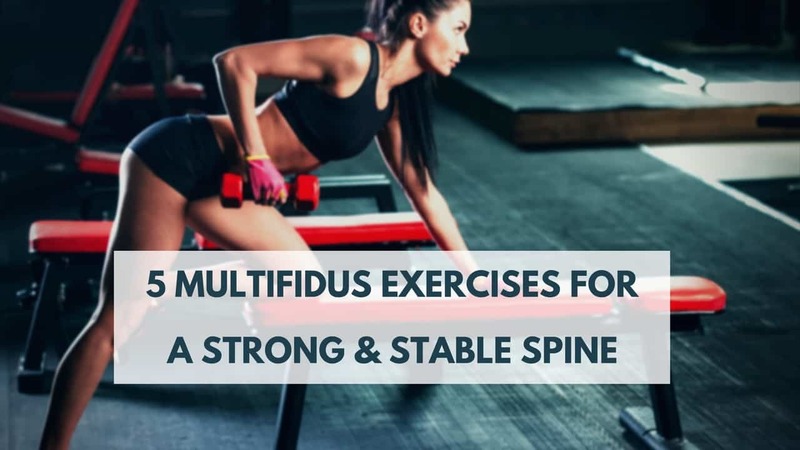 Use these multifidus exercises to build and maintain a strong, stable, and pain-free spine that will make living your active lifestyle a breeze.